Concert featuring Fantasia on Christmas Carols by Vaughan Williams and a Christmas Composition for Choir and Orchestra by Edward Davies. Carols will be followed by Mince pies and Hot drinks. 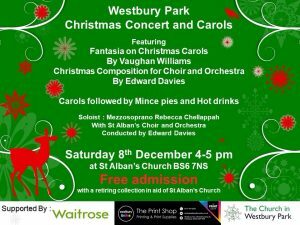 Featuring Mezzosoprano Rebecca Chellappah with St Alban’s Choir and Orchestra conducted by Edward Davies. Free Admission with retiring collection in aid of St Alban’s Church.